Permission is a “must-have” in email marketing and means that each recipient on your list requested to receive emails from you. Before you think about getting an email sender program, focus on getting permission from your potential recipients. It’s easier than you think. You’ve got a website. Otherwise you shouldn’t be sending email marketing newsletters at all, right? Just place a signup form on your website or blog, or create a standalone squeeze page and let people subscribe to your emails. As an incentive, you can give them a free PDF report, e-book, free download, discount to buy something from you in return for their email address. People will come to your site and subscribe deliberately giving you the permission to email them. If you have a WordPress blog, you can use our confirmed opt-in plugin to put a signup form to your blog. If you prefer a squeeze page, you can read more about squeeze pages in our Email Marketing Secret #1 PDF report. Getting the recipient’s permission requires some time and efforts but you will be rewarded with better Inbox deliverability, fewer bounces and spam complaints, and most important with higher open rate — which is your primary goal as email marketer. Very opten fiery email marketers driven by the desire to send as more as possible buy millions email addresses and send them straight away. What happens next? The email campaign generates many spam complaints and bounces and one day they find themselves blocked by many ISP. Their email deliverability suffer, they lose subscribers and sales. Never buy, rent or harvest email addresses even if they are opt-in for someone else’s newsletters. If those people didn’t ask for emails from YOU, and you are sending them, then you’re sending spam. Building your own opt-in list takes time and patience. Don’t feel upset if you start with a few dozens subscribers only. In a week you will email to two times more. In two weeks you’ll have three times more recipients who really want your emails. It’s like you are moving at a snail’s pace but finally you’ll beat in sales and profit those who are using blackhat email marketing techniques. Do not put your email campaign preparation off the last minute. In a hurry you can do more harm than good. You’ll want to remember that different email clients render HTML emails differently and different ISPs treat email differently. While you may be thinking that you are sending great campaigns but in reality it may be the opposite. That’s why you have to spend some time for testing your email design in different environments. The easiest way to do it is to run an Inbox placement and spam filtering test before sending a real email campaign to determine how your message is treated by major Internet providers around the world and whether it is delivered to the Inbox, spam folder or blocked before reaching the recipient’s mailbox. Check your mail server’s IP address against DNS based blacklists every few email campaigns. You can use the G-Lock Apps delivery and spam testing tools to see your inbox placement, spam scores, authentication issues, daily blacklist monitoring to check if your server’s IP address is blacklisted and get summary email alerts if any problems are detected. Plus, you can send a copy of your email to your friends and colleagues to test it on different operational systems, in different email clients and even mobile devices. Send them test emails and ask them to tell you how your email looks. If you find that your email comes in an unreadable format in the majority of email applications and web mail accounts, hold on and take time to fix the issues. You value each subscriber and don’t want people to unsubscribe because they cannot read your email. If you are not good at HTML design and coding, consider using professionally designed responsive HTML email templates from the EasyMail7’s Template Store. If you sell some products or services online, your buyers expect invoices, receipts, product shipping notifications, and welcome messages from you. These are transaction emails, and they are not the same as marketing or promotional emails. Marketing emails are email newsletters, offers, discounts, coupons and other commercial email messages. Do not send marketing emails to your clients or customers until they give you the consent to receive commercial emails from you. The fact of their purchase does not give you the right to send them marketing emails. Send them personal invitations with a link to your signup form or squeeze page asking them to subscribe to your list. Some email marketers create a nice signup form or squeeze page but start emailing the subscribers a few months later. Despite the fact they got the permission, their emails generate many spam complaints and bounces because the subscribers most likely forgot about their subscription. This happens quit often. Some email marketing experts say that the subscription loses its urgency if you don’t email the subscribers for 6 months. So, if you have not emailed your list for a few months, keep in mind that some people on your list may have forgotten about you. Before you start sending them marketing emails again, send them a short “remember me?” email, remind them about their subscription and provide them with the unsubscribe link in order people who are not interested in your emails anymore can unsubscribe. Since email can reach the subscribers all over the world, email marketers often try to make as much sales as possible with their commercial emails. It’s normal for online business. But in a rush for sales it’s very easy to cross the border that separates good email marketing newsletters from spam emails. If you abuse exclamation marks, caps, colors, or create the whole email as one big image with no or little text, be ready to be penalized by spam filters for “spam looking” content. Instead of thinking as a seller, think as a buyer. What would make you buy your product? How does your product make your life easier? What does it do for you? Ask yourself these questions and formulate the answers in the email to make people want to try your product or service. Tell them what they will get from your product. List the benefits to make them sure they can’t live without it. Write in a normal human language without any sales pitch like “BUY NOW!!!! !” or “THE BEST OFFER!!!!!”. While your personal free email address from @yahoo.com, @aol.com or @gmail.com is good for communication with your friends, it is not good for commercial email campaigns to your subscribers. Firstly, it does not add to your sender recognition and some subscribers may not know the email is coming from you and delete it without opening. Secondly, it does not contribute to a good image/reputation of your company or yourself. So, use the email address from your website domain to send marketing emails. You can even setup a specific email address for your newsletters like newsletter@yourdomain.com or subscription@yourdomain.com. It works too. You should not think that the subscription is forever. People change job, interests, preferences. So, it’s normail that someone decides one day that he doesn’t need your emails anymore. You don’t want them to hit “Spam” button on your email to cancel their subscription, do you? That’s why before sending each email make sure that you included an unsubscribe link into it and that your unsubscribe process works smoothly. Ideally, you should allow people to not only unsubscribe, but to also update their email address/name with you because sometimes people may only want to receive your emails at a different email address. If you can’t handle unsubscribe process online, link the text like “Click here to unsubscribe” or “Take me off” to your email address to let people send their unsubscribe requests to you via email. EasyMail7 provides you a ready-to-use unsubscribe link. 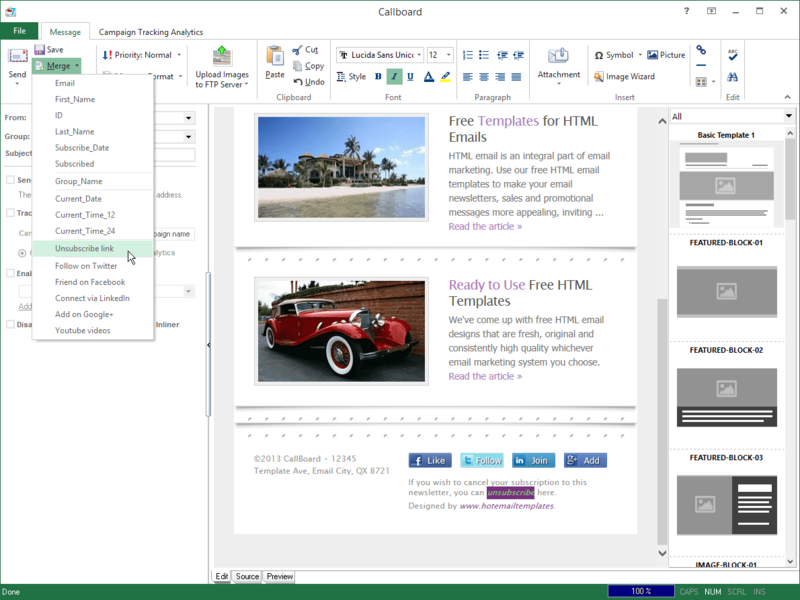 You can quickly merge it into your message with two mouse clicks. Unsubscribe emails will be sent to your Return email address. You can then process unsubscribe emails and add the email addresses of the recipients who unsubscribed to the “do not send” list on auto-pilot using the Bounce Handler in a EasyMail7. You can also setup an online unsubscribe process if you use G-Lock Analytics email tracking service or WPNewsman subscription plugin together with EasyMail7. It’s not only about email marketing etiquette but about your sender reputation too. Though your list is opt-in, some emails may bounce. Take care about deleting bounce email addresses from your list. To help yourself deal with bounces, you can create a specific email address like “bounce@yourdomain.com” and enter it into the “Return email address” field in your email sender program. In EasyMail7 you can enter a separate email address for bounces in the Account settings. If you receive unsubscribe requests via email, setup a separate email account for unsubscribe emails too in order not to mix them with other emails in your general Inbox and don’t forget to exclude those people from your next email campaign. Plus, take care about spam complaints. They come when someone on your list clicks “This is spam” button upon your email. Don’t be surprised to get spam complaints from an opt-in list. People may forget about their subscription, or may not find the unsubscribe link in your email, or may not like your email content, or whatever (you can’t get into their mind, right?). To be notified when your message generates a spam complaint, take time to signup for feedback loops with major ISP. You see you have a lot of work to do after the email is sent. To make your life easier, we’ve added the Bounce Handler to EasyMail7. It can automatically check your email account for bounce emails and delete hard bounce emails from your contact groups. What if you ignore bounce, unsubscribe emails and spam complaints? Your ignorance is fraught with worse deliverability of your future emails and with serious troubles with ISP or your email service provider up to your account cancellation. One of the advantages of email marketing is that you can measure your subscriber’s interest in your email by tracking your email opens and link clicks inside the email. 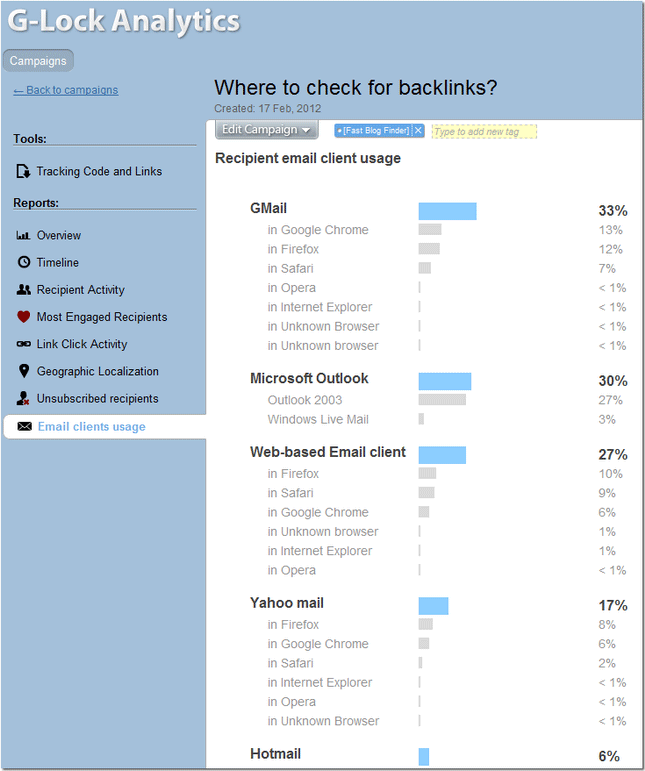 There are lots of email tracking services on the Internet and it’s surprising why many email marketers never use them. Email tracking reports are extremely useful. You can change the email design, sending day/time, call to action, subject or whatever you may think of, compare open rate/click rate from different email campaigns and find what works best for your subscribers. Our email marketing software works well with our G-Lock Analytics email tracking service. You can watch this quick video to learn how to track emails using G-Lock Analytics service. In addition to tracking email opens and link clicks, G-Lock Analytics tracks who printed and who forwarded the message, who actually read the email and who simply skimmed or glanced it. You will also get the report about the email clients your recipients used to open your email — you will know which email clients/web based accounts you need to tailor your email for. As you see email marketing campaigns require preparation, research, knowledge and patience. You’ll become an expert in email marketing through the trial and error method but while you are doing your first steps keep in mind our Top 10 Mistakes list and try to follow good email marketing practices in order not to nip your initiative in the bud.